The Valkyrie Assault Carrier is a twin-engine attack craft used for aerial insertions and drop missions. Screaming across a battlefield, a Valkyrie aircraft deploys its cargo into the fray, providing a deadly torrent of covering fire as the troopers within disembark. Valkyries carry a fearsome array of anti-personnel rockets that can shatter entire formations. Lethal strafing runs leave a trail of destruction in their wake. 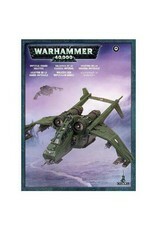 This box set contains one multi-part plastic Imperial Guard Valkyrie. 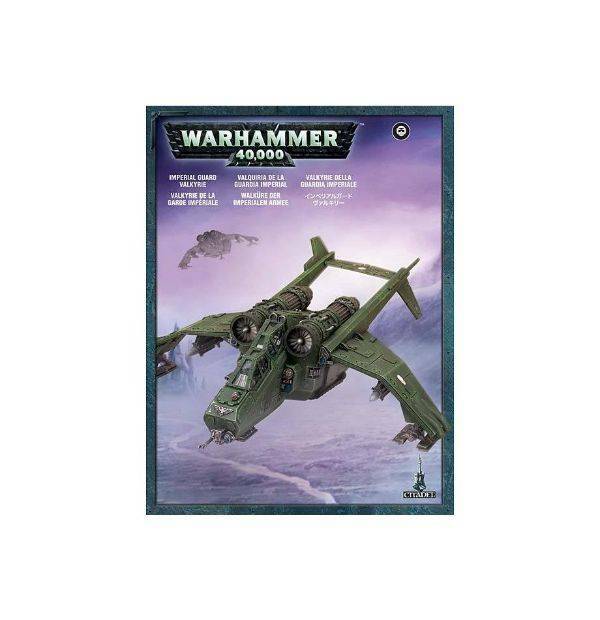 This 128-piece, finely-detailed, miniature can be assembled in a number of ways and with a number of weapon options, including: rocket pods, a lascannon, a multi-laser, Hellstrike missiles and pintle mounted heavy bolters. Model supplied with a large oval base and an all-new clear-plastic flying base that will secure it in a heightened flying position.